Since announcing initial changes to the ABIM Maintenance of Certification (MOC) program earlier this year, the ABIM Board of Directors and I have asked for and received feedback from thousands of practicing physicians across the country. A number of physicians have let us know that there is one particular issue that they felt should be addressed as quickly as possible: the link between certification status and enrollment in MOC. This policy had a particularly adverse effect on those who just completed training or were engaged in fellowship. That did not seem right to me, to our Board or to many other members of the internal medicine community. After listening to members of the community—especially program directors and society leadership—and hearing their thoughts around this issue, the ABIM Board of Directors unanimously agreed that ABIM needed to change this policy. Effective immediately, diplomates who are meeting all other programmatic requirements will not lose certification simply for failure to enroll in MOC. What does this mean for diplomates? Diplomates who lost certification solely on the basis of failure to enroll in MOC or to pay MOC fees have now had their certification status updated to “Certified.” There is no further action they need to take. Diplomates who wish to be reported as “Participating in MOC” must be enrolled in the MOC program, be current with their payments and be meeting ongoing program requirements. Diplomates who earned initial certification since 2013 or renewed certification since 2014 who no longer wish to be enrolled in MOC this year as a result of this policy change may be eligible for a refund of their 2015 MOC enrollment fee(s). Please note that if ABIM provides a refund, MOC enrollment will be canceled, the physician’s status will be reported on abim.org and to the American Board of Medical Specialties (ABMS) as “Certified, Not Participating in MOC”, and the physician will no longer have access to ABIM activities or their MOC Status Report, which gives them their specific requirements and deadlines (refund requests must be in by October 31, 2015). We are making this change based on consistent feedback from the community of diplomates. If you have any questions about your certification status or you believe it is not correct, please contact our Diplomate Services Department at request@abim.org. I also would like all of you to know that this will not be the last program change that ABIM will make, and we know it isn’t the last issue on which we are receiving feedback and guidance from the community. To be sure all changes we make are informed by a very broad and diverse community, it is important that we not rush this process and that we continue to hear from diplomates and the patient community we serve. We want to get it right, and that requires time and work. The Board of Directors and I are personally committed to working with the internal medicine community and implementing changes that evolve the MOC program into something that internists and subspecialists find meaningful and something in which all of us can take pride. 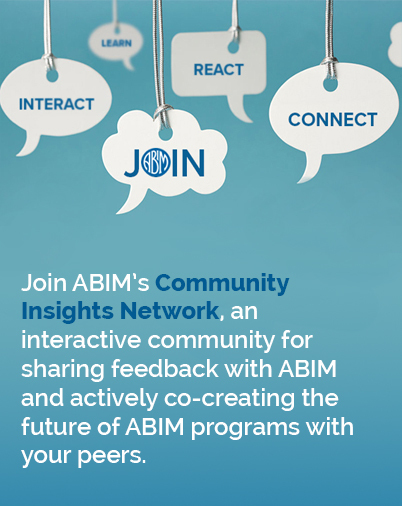 As we move forward, I hope you will continue to share your thoughts and feedback so that ABIM and its programs can continue to help you in your pursuit of lifelong learning. This post was updated 10/14 to reflect refund deadline.